Whether you need waste disposal for a big construction project or weekly trash pick-up, we can provide the right solution for your needs! 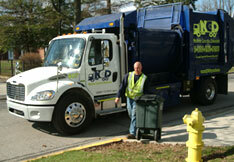 Serving the waste disposal needs of Northeast Indiana Since 1972! Noble County Disposal, Inc. provides a variety of waste disposal solutions to homeowners and businesses in Noble County and surrounding area. Best known for our flexibility in meeting needs of each individual customer, you’ll have peace of mind knowing that your waste is being disposed of quickly and professionally. Noble County Disposal, Inc has built business by giving reliable service at reasonable prices. We remain family owned and operated. Call us today and put our proven track record of customer satisfaction to work for you. Whether you need daily service or a one time clean up, we are here to satisfy your waste disposal needs. For residential customers, we offer three different NCD tote options for weekly service, and even special pick up for large items. We offer 3, 4 and 6yd clean up containers smaller for remodeling and roofing jobs or just cleaning up around the house. For that little bit larger job we have 10, 15, 20, 30 and 40 yard roll-off boxes.